Action For Nature, Inc. is an international non-profit organization based in San Francisco, California, that encourages young people to take personal action to better their environments and to foster love and respect for nature. Learn to love and respect the natural world in which you live. and the annihilation of many of the creatures — including human beings — found in it. Personal action is a powerful weapon in the battle to keep our planet alive and well. When taken, it can slow down a river’s pollution; help preserve the ancient growth of trees threatened by cutters; and increase the survival of songbirds. This book shows how effective personal action can be. 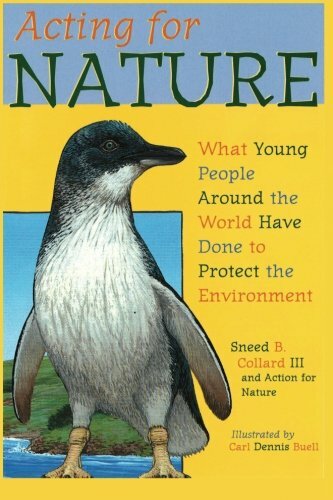 This wonderful collection shares stories of young people who took personal action to help the environment; the book is an inspiration to all who read it. Action For Nature, Inc. grew out of the concern of an individual who took personal action to protect nature. In 1982, Shimon Schwarzschild, an environmental activist from San Francisco, California, visited Assisi, Italy, where St. Francis, protector of animals, had once lived. In Italy, Shimon discovered that the songbirds of Assisi and nearby Mt. Subasio, whom St. Francis had loved and cared for 800 years before, were being hunted, killed and eaten by the thousands. Shimon was outraged, and decided to take personal action. He knew he had to do something to protect the songbirds of Assisi. He began by finding out who was killing the songbirds and why. He realized that the slaughter of these beautiful birds was wrong and should be stopped. He soon received offers of help from others when they found out about his campaign to protect all of Assisi’s songbirds. They had always been sad or angry about the killing of songbirds but thought they could do nothing about it. When they found out about Shimon’s campaign, they were happy to help. Shimon called his effort the Assisi Bird Campaign (ABC). Shimon wrote many letters about the tragedy of Assisi’s songbirds to people and organizations around the world, asking for their help. He also wrote articles to help publicize the effort. He soon joined forces with others, particularly his friend and fellow nature protector, Maria Luisa Cohen. She contacted local environmentalists and nature protection organizations in Italy. Then, Marisa, Shimon, and the famous nature protector, David Brower founded Assisi Nature Council (ANC) to seek permanent protection for Assisi’s songbirds and to help people, especially the young, understand that their neighborhood, as well as the whole planet, needed protection from environmental abuse. One office was located in Assisi, the other in San Francisco, the city named after the same patron saint for nature who inspired Shimon to protect Assisi’s threatened songbirds. Photo source: Donald Cohen at Assisi City Hall, October 8, 1984. Deputy Mayor and Assisi Nature Council (ANC) EUR President Marisa Luisa Cohen and Earth Island Institute President David Brower look on while Assisi Nature Council USA President Bert Shimon Schwarzschild signs the ANC statutes. Thanks to their efforts, there was a global outcry from men, women, and children, to save the songbirds of Assisi. In 1984 the city of Assisi agreed to permanently ban the hunting of songbirds on Mt. Subasio, and later the Province of Umbria approved a plan to create a nature preserve on the slopes of the famous mountain. But it did not stop there. After the success in Assisi, Shimon wanted to continue to encourage everyone, especially young people, to take personal action to conserve and restore our planet’s environment. And so our name was changed to Action For Nature to reflect our continuing mission - encouraging young people to act for nature. The story of Action For Nature is the inspiring story of how one person can help save our planet. It is our goal to encourage others to use their initiative to solve an environmental problem, and to support efforts of young people around the world who want to make a difference.